The school holidays are nearly over so finally I can back to work, although we do have holidays booked and then will be moving house so not sure when I will fit in the work I need to do. But things are busy! I got a new assignment from Traveller to do some maps of the Balaeric islands and had to re-quote on a job for Carrick House on Loch Lomond to do a series of plans, along with the work for Value Retail which might turn into a series of animation for there website. It will be nice though just to be able to sit down and work most of the day again, although i do have to sort out my broken car and cope with the trauma of supporting WBA!!!!! The Have-Yachts, I love that saying, Its not about having a boat its about the complete ability to live a life style that not many people can afford.Why am i talking about this? Well I just got a commission through Kate for Capitol File Magazine published by Niche Media in NYC to do an illustration for the have-yachts section of there magazine. Lets see how that goes shame its not an invitation to join the Ralph Lauren set in the Hamptons! 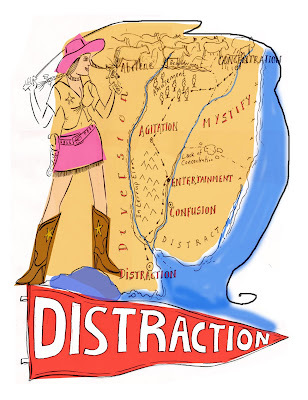 A visual for a piece of self publicity by my USA agent.To show an illustrated map in a different way while illustrating the saying 'Driven to Distraction' I wonder how this might develop as i do the final image!! Easter is a time to get hot and bottered on the roads of the UK. This year we decided to visit Scotney Castle in Kent or Sussex. The house once belonged to Christopher Hussey who I read many times when doing my A level architecture and when working on my thesis on Garden Design. It turned out to be a lovely place full of wonderfully romantic vistas, quiet walks and many visitors!! It would be nice to go back when the azaleas are in bloom as the colour will add a new dimension to the place. Today is good Friday, at least it was right on one accord! Actually the weather has been great and spent some time in the garden with the family the weather got to nearly 20 degrees- Corrrrr wata Sorcher! Mowed the grass, did some weeding, cleaned down the garden furniture and played football with Andrea, Maddie Frank and Irene apprantly the boys won 123456 to 123 I think Maddie need to learn to keep the score better. I also managed to finish off the Nigaraguan map for Outside as the Americians dont have Good Friday as a Holiday. I also entered the Map into this months creative Flair illustration competition. Square Meal another of my clients! Today maddie (my daughter) has gone to A Drama Course which gives me part of the day to do some work!! Which seems to be pileing up at the moment but I'm not that bothered about it:-) Toady I need to complete the visual for the Bermuda map then off to Bicester to meet up with Clients from Value Retail.Hopefully that might bring in some more work? But I have three maps on the go over Easter followed by a publicity piece for my agent. 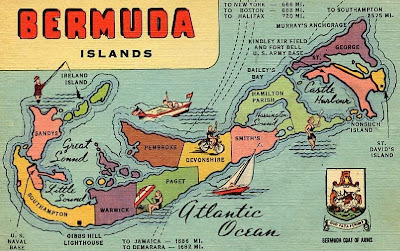 But here is a map of Bermuda i found while doing so research. So it was late Friday night and I get a series of e-mails from my agent- Kate Larkworthy and the Art Director at Travel and Leisure to do a new map assignment for the USA edition of Travel and Leisure, a half page map of Bermuda. So time to find out a little bit about the place so I will let you know more about that soon. 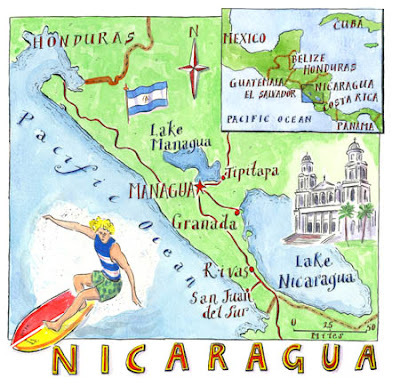 Meanwhile I am working on a Map of Nicaragua for Outside magazine which is interesting to look a little closer at Central America and it reminds me of my Old friend Robert Tinsley who lives in Costa Rica who i really should contact soon. So Its Bermuda, Nicaragua and Furnace this week all before Easter on Sunday.